Pic: Zodiac operations at Palmerston Atoll. The tiny Pacific island nation of the Cook Islands occupies an inordinate amount of space. For the 2.25 million sq km of ocean, just 240 sq km comprises any sort of land. This rare, habitable commodity is divided between 15 major islands and supports 13,000 residents who hold NZ passports and spend NZDs. 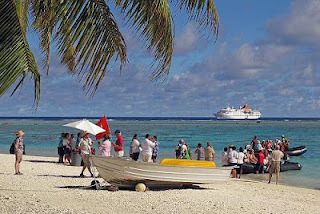 The major island of Rarotonga (or just Raro, for short) is 32 kms around the perimeter road and hosts the majority of population and activities. Despite the lack of a tie-up wharf, cruise ships of all sizes still make occasional stops at the port of Avarua where they disembark by tenders boats and disappear for a few hours on well-organised tours or just wander the quaint seaside shopping district in search of that iconic souvenir, the black bearl. Aboard the MS HANSEATIC, the famous 184-passenger German expedition cruise ship, we make a couple of extra stops in this island group. 220 kms north is Aitutaki, a sleeping atoll known for a couple of high-profile destination resorts. The little island opened up to the world after the US SeeBees built an airstrip in 1942 and the recently renovated airport is as busy now as it was during the frenzy of WWII. Again, I bypassed the organised tours in favour of a one man mountain bike safari ($8NZD/day from Rino Rentals). It was fun to greet the locals with a lusty 'Kia Orana' and see their bemusement as the flabby white guy puffed and panted his way around the island. I also had time for a quick scuba dive with Onu Hewett (PADI Bubbles Below) and spent the first few minutes encircled by a mass of colourful reef fish competing for the half a coconut he gave me. The voracious little critters chomped at the white flesh with such force they nearly knocked the thing out of my hands several times and one particularly greedy parrot fish nipped the end of my finger. Ouch. The undersea environment is mainly hard corals and rock in which turtles and reef sharks are common. Access to the wharf at Aitutaki was by ship's tender, in this case the covered lifeboats. All freight must be barged ashore as even the smaller freighters can't penetrate the tricky lagoon with its many coral obstacles. Also at the wharf was an massive twin-hulled Polynesian voyaging canoe (vaka) undergoing a painstaking restoration. 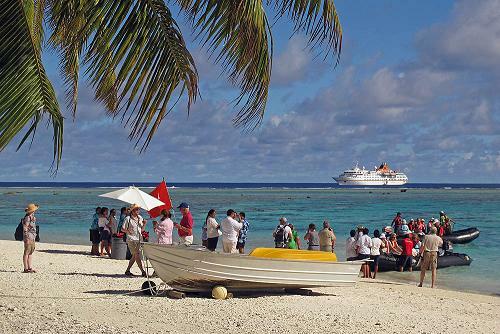 'Te Au O Tonga' was built in 1994 as part of a Pacific-wide voyaging event culminating in Hawaii. Progress is slow, but steady. Our third and last stop in the Southern Group of the Cook Islands is at Palmerston Atoll, a true 'Gilligan's Island' experience. Named by Cook in 1774 the island was annexed from the British Government in 1863 by a renegade ship's carpenter, William Marsters, who turned up with two Polynesian wives on the then uninhabited atoll. He added a third wife and 23 children, with 50-odd descendent still occupying the island in a most curious feudal system. There's a church, a clinic, a school, a main street, a relatively new solar-powered, satellite telecommunications system (currently inactive) and lots of coconuts. No aircraft can land on Palmerston and a freighter visits only a couple of times each year. Occasionally yachts drop in, but the lagoon is a formidable barrier passable only with an experienced local 'pilot' to guide us. Our visit is part supply run as we ferry boxes of essentials to the tiny community from Aitutaki. There's much jubilation as bags of flour and rice and cartons of beer and cigarettes are unloaded. Enormous frozen parrot fish, the only cash economy of the island, are offered in return. As we wait for our departing Zodiac shuttle, two heavy coconuts thud onto the sand just a couple of metres away reminding me of the welcoming prayer from Rev. Marsters, "May the Lord give us guidance and protect us from falling coconuts!" Amen to that.